Indian cuisine is known worldwide for the variety of flavors, spices and aromas that offers. Now that we had the chance to try original Indian flavors we can verify the rumors! And you want to know a secret? The food is not that spicy after all! 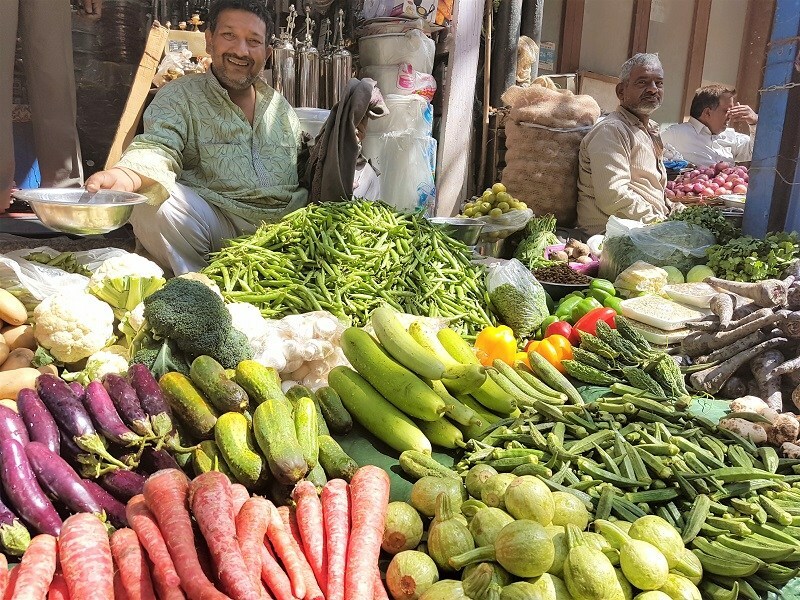 During our stay at Delhi we had the chance to take a tour with Food Tour in Delhi and get introduced to the exciting but also intimidating Indian cuisine. Let me tell you that this was one of the best experiences during our short stay in India. Specialized people with love and knowledge for what they do, ready to help you with your adventurous palate. So if you find yourself in India and especially Delhi we strongly recommend to take a tour with Food Tour in Delhi. Our food tour started at 10.30 am when we met our guides, Rajeev and Shikha. The tour lasted for about 6 hours and involved tasting of traditional and contemporary flavors of Indian foods from street stalls and restaurants at Old and New Delhi. So we started along with other 3 excited travelers to explore the tastes of India, or at least some of them! At our first stop Rajeev and Shikha brought us small plates which included veg curry, traditional Indian breads and super tasty sweet lassi. During our tasting Rajeev explained us the variety of flavors and the different scales of spiciness, as well as the kind of breads that Indians eat. The tour continued in many little restaurants and secret food stalls that would be impossible to discover on our own! Our favorite delights was mango kulfi (ice-cream), which we tried in a small hidden shop and chola bhatura. After tasting other interesting Indian dishes, like chole kachori (spicy, but survived) we headed to New Delhi. There we had the chance to taste gol gappa (or pani puri), which is a hollow deep fried kind of bread with spicy water inside. To tell you the truth it wasn’t one of our favorite flavors but you got to try it! Our tour didn’t include only tasting yummy Indian food but also exploring and walking through Old Delhi under the guidance of Rajeev and Shikha. There we had the chance to take photos and discover old historic buildings with special architecture and colors. Forgot to mention that we also had the chance to hop on a rickshaw and a bicycle rickshaw! Of course during this tour we couldn’t skip the spice market! Unfortunately, it was not fully open because it was Sunday but we had the chance to visit some stores and feel the spices come into our noses. The most intense part of our experience was our visit at Gurudwara Bangla Sahib which is a Sikh temple. Rajeev escorted us to the temple’s kitchen and we had the chance to see something wonderful. Every day this kitchen offers a cooked meal to more than 10000 people. It doesn’t matter who you are, or where you came from. It matters that every day so many volunteers cook to offer a meal to people that they don’t know and have nothing to gain from. Food Tour in Delhi doesn’t organize only food tour. It organizes experiences! If you are a photography lover, they offer many tours where you can have a chance to reveal your talent. The choices are endless. From the streets of Old Delhi to historical monuments and much more. If you are a food and photography lover you can combine them in one tour! For more information contact Food Tour in Delhi.